Much like the gallant Knights in jousting tournaments of yore, WW1 fighter pilots engaged in a modern version of the medieval joust. Each aviators survival depended greatly on both his skill and the quality of his aircraft. WW1 aviators were brave men who fought heroically in a tragic war. 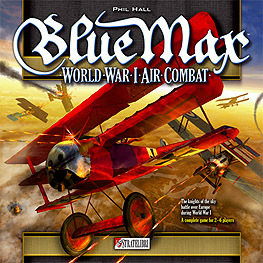 Blue Max is a World War 1 aerial combat game for 2 - 6 players. Players divide into two teams and take on the role of pilots trying to shoot down the greatest number of enemy planes.